Woohoo! Django and John just found me in the coffee house next door to my studio so that they could deliver two awesome retired cymbals, which Django has generously offered up for this experiment. Aren’t they beautiful! Thanks Django for donating these lovelies! I’ve been looking for cymbals to use for making the boxes that will serve as the houses for the translation-objects that I’m cooking up from the plane-poems. Joseph Cornell’s boxes served as early inspiration when I begin thinking about how to present the translation-objects. I intend to suspend the whole collection—all forty-nine elements of it— from the ceiling at eye-level so that the “poems” can be interacted with as beings in the room. You’ll be able to approach, walk around, and read them as beings in the space much like we do with human beings in a space. because I like the idea of recycling materials for this project. 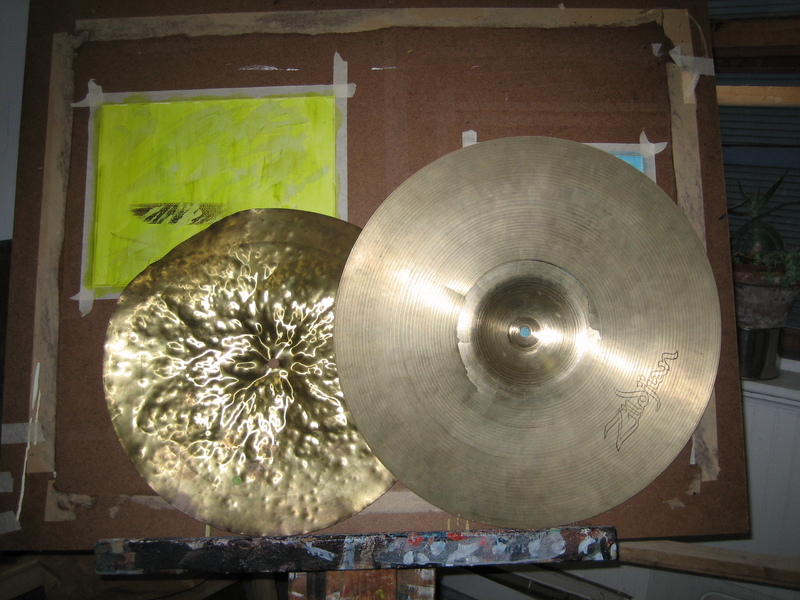 ….if you happen to have some cymbals packed away in a closet, the attic, the garage, your trunk and/or you know drummers, orchestras, or school bands with a stash of cymbals past their first-life’s prime, I’m hoping that you will consider offering them up for a second life with American (post). Please stay tuned for the “Calling All Cymbals” shout-out. Looks awesome! I was reading something entirely unrelated (Jung lectures on Yoga) and came across a reference to the etymology of the word “symbol”. Jung defined it as meaning something like “throwing or casting things together”. I love the interplay between the “cymbals” as houses for translation-objects and “symbols” as “throwing things together”. In addition to the bronze being “symbolic” and culturally resonant I think the cymbal as collecting box is almost literally “symbolic”. Maybe? Really interesting connections. I’m so glad you added your insights to the stew!